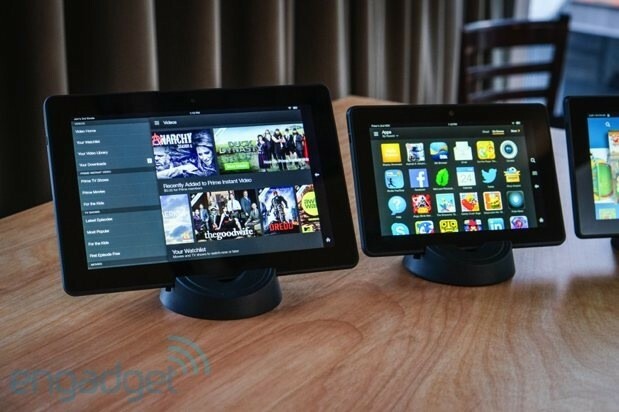 The HDX also marks the arrival of Amazon's latest tablet OS -- and this time it has a name. The company's referred to the software internally as Fire OS for some time now, and has decided to let us in on the action for version 3.0, which carries the codename "Mojito." In a cute twist, it offers an alternative to Google's confectionary naming scheme, though if you were to dig far enough, you'd still find a Jelly Bean base here. The operating system maintains most of its predecessor's defining UI designs, built, as ever, around content. At the center, you'll find a river of apps, movies, games and the like, though now you can also opt for a more smartphone-esque grid version. Bezos swipes down from the top of the display to pull up some quick settings options: Auto-Rotate, Brightness, Wireless, Quiet Time (to shut off notifications when you're doing things like reading) and the new software feature he's most excited about -- that third piece of the puzzle. He taps on a life preserver icon bearing the word "Mayday." A little box pops up in the corner of the screen. It buffers for a moment and a face appears. He introduces himself as "Dylan," adding "Hey Jeff," slightly giddy at addressing the billionaire founder of his company. "We have a few friends here, and I want to show off the Mayday button," explains Bezos. "It's very complicated to do tech support over the phone," the executive adds, with Dylan waiting patiently on the other end. "With Mayday, a tech advisor appears on your screen and walks you through how to fix things." On his end, Dylan (or whoever among the thousands of support reps you should happen to be paired up with) can see your display, but not you. Ask him for some help (or something as inane as recommending a new game) and he'll walk you through the steps, drawing circles and arrows along the way, like some Monday Night Football commentator. Or, if you choose, he can just do it for you. You can also move the box around or he can do that for you, as well. If you have to enter a password, meanwhile, he can shut off screen-sharing. "It's 24/7, 365," says Bezos. "If you look at Amazon's history, we're uniquely positioned to deliver this feature. We already have thousands of technical reps, and if we need to hire more people, we will." The company's goal is to keep wait time down to 15 seconds or less, though, as Bezos notes, Christmas Day will certainly put that to the test. But, "the Mayday button will be ready," he adds confidently. Oh, remember when we mentioned that there's no HDMI out on the HDX? Well, the device doesn't actually stream directly to your TV. Using Second Screen, devices like the PlayStation 3 and 4 and Samsung smart TVs stream content from the cloud, even as you use your tablet to control it. That means that the device is freed up to offer contextual information through X-Ray, so you can find out the names of actors and songs, check out trivia through IMDb and, naturally, buy more Amazon content. Also of note is expanded enterprise support. Apparently a lot of people have mentioned bringing their Fire to work, and Amazon has listened, adding VPN support and Mobile Device Management through companies like AirWatch and Citrix. And, of course, Goodreads support is coming, though, as with the Paperwhite, you won't be getting it at launch. You'll have to wait for the upcoming 3.1 upgrade to let your friends and loved ones know precisely what you thought of Stephen King's Under the Dome. Both versions are available now for pre-order. The 7-incher will run you $229 when it starts shipping October 18th. The 8.9-inch version, meanwhile, isn't set to ship until November 7th. That one will run you $379. Add $100 to either, and you'll get 4G LTE through either AT&T or, for the first time, Verizon.